on such hit singles as The Who’s “I Can’t Explain”), and in 1967 created The Flower Pot Men whose hit “Let’s Go to San Francisco” reached number 4 in the UK Singles Chart. By this time Carter and Lewis worked purely as songwriters, arrangers, producers and studio based musicians. If their recorded work subsequently found an audience, as with The Flower Pot Men and The First Class, they organized a group around that name to actively promote the recordings via concerts etc. John Carter sang the lead on the no.1 hit “Winchester Cathedral” and later wrote the hit song “Beach Baby”. The Ivy League originally consisted of members John Carter and Ken Lewis (previous members of Carter-Lewis and the Southerners); plus Perry Ford. All three members were session singers who possessed high-pitched singing voices. They were first heard doing background vocals for The Who on their hit single “I Can’t Explain” in November 1964. After that song, the band never called on the Ivy League again, as John Entwistle and Pete Townshend were able to handle the backing vocals. Their debut single, “What More Do You Want” generated little interest, but the second release, “Funny How Love Can Be”, turned out to be a surprise UK Top 10 hit. Further hits followed, including “That’s Why I’m Crying” and “Tossing and Turning”, the latter of which reached #3 in the UK chart. The original trio released just one album, 1965’s This is the Ivy League â€“ panned in the music press as disappointing, with its excessively wide spread of musical styles and material â€“ before both Carter and Lewis left the group. Carter departed in January 1966, with Lewis leaving about one year later. The duo then set up a production company called Sunny Records. 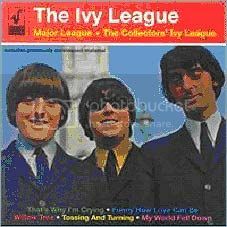 With replacement members Tony Burrows and Neil Landon taking the recently departed original members’ places, the Ivy League issued two more albums, 1967’s Sounds of the Ivy League and 1969’s Tomorrow is Another Day., but these were compilations of earlier singles and album tracks. Several more singles followed, including the minor hits, “Willow Tree” and “My World Fell Down”. A cover version of the latter song provided the U.S. band, Sagittarius, with a #70 chart placing in the Billboard Hot 100 in 1967. Success for The Ivy League in the United States was minimal, with only “Tossing and Turning” hitting the Billboard charts, making a modest high of #83 on the Billboard Hot 100. Carter and lewis masterminded The Flower Pot Men, hitting #4 in the UK with its single “Let’s Go To San Francisco.” Messrs Carter and Lewis then fulfilled the role of managers. Burrows and Landon left The Ivy League to join the touring version of The Flower Pot Men, leaving Perry Ford to carry on with new personnel. He stopped using the name in 1975. In the 1980s a band started touring under the name The Ivy League which performed the group’s hits at nightclubs and Sixties nostalgia events, even though none of the earlier members were involved. During the 1990s, several best of compilations surfaced, including 1998’s 43 track Major League: the Collectors’ Ivy League. Two other bands have also used the name: The Ivy League, a North Carolina based rock band and This Is Ivy League from New York City. 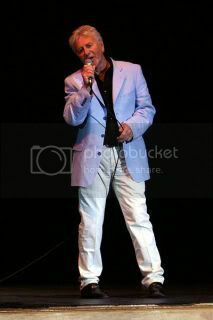 Tony Burrows in concert. Taken on May 17th, 2008. Carter’s replacement was Tony Burrows from The Kestrels. His voice is also heard on many UK hit singles of the 1970-1975 era, such as, White Plains: “My Baby Loves Lovin'”, Brotherhood of Man: “United We Stand”, Edison Lighthouse: “Love Grows (Where My Rosemary Goes)”, First Class: “Beach Baby” (another John Carter project), plus The Pipkins: “Gimme Dat Ding”. Lewis was replaced by Neil Landon, who also went to The Flower Pot Men, leaving Perry Ford to carry on The Ivy League with various personnel until 1975. A band called The Ivy League continues to perform, with the present day line-up comprising of Jon Brennan (bass guitar/vocals); Dave Buckley (drums, vocals) and Mike Brice (guitar, vocals). They have no connection to the original band that existed between 1964 and 1975. The original Ivy League were a multi-talented outfit, with Perry Ford in particular a wonderful session pianist, and John Carter and Ken Lewis brilliant songwriters. The current line-up of Dave Buckley, Jon Brennan and Mike Brice carry the legendary name of The Ivy League into the 21st century with great aplomb, their own soaring harmonies a credit to them, and the original line up. I believe I am a distant relative of John Shakespeare (Carter). This was told to me by my late mother Marjory Ashmore. It would be wonderful if I could get in touch with John . I believe I am a distant relative of John Shakespeare (Carter). This was told to me by my late mother Marjory Ashmore. It would be wonderful if I could get in touch with John, as I believe this information to be true. Arthur Ashmore.